This section allows you to create groups of questions which can be displayed on your registration forms. A group must contain at least one question and if a question is not assigned to a group it cannot be shown on the registration form. By default Event Espresso comes with two question groups: Personal Information and Address Information. The Personal Information group is required by the plugin and cannot be removed, and is added to every single event. There are two sections that need to be filled out in order to create a new group: Group Information and Add Questions. Group Name: Add a name for the overall group. Group Order: Here you can numerically set the order of the question groups. A setting of 1 (one) will place it at the top. Group Identifier: This will be created automatically after the group has been made. Description: Add a description to help users understand the questions context, reason for those questions, more information, etc. Note: Personal Information will always be the first question group. Show group name on registration page? : If ticked the group name will appear above the questions from that group. Show group description on registration page? : If ticked the group description will appear above the questions from that group. This section lists all the questions that have been created, including the core questions. Simply tick the ones that you want included within this question group. To finalize the question group, click the Add Group button. 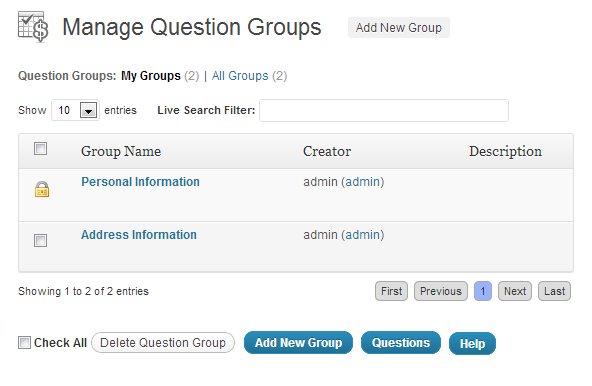 Below the Group creation area is a list of all Question Groups created. You can quickly edit or delete Question Groups from this area. 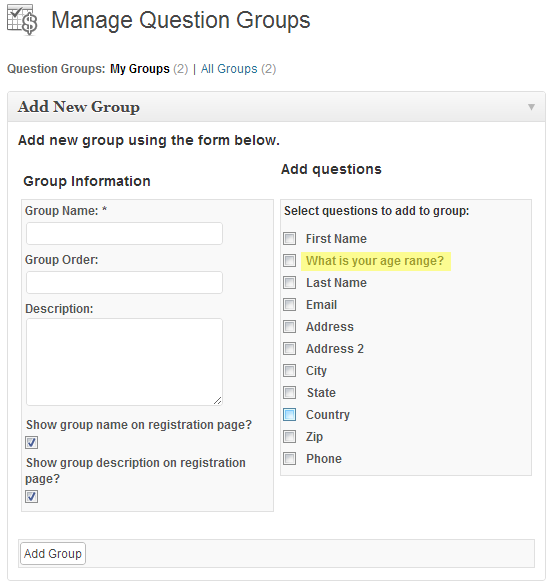 You can drag and drop the question groups here (or on the Manage Question Groups overview page) to change the order that the question groups are displayed on the registration page.